When you buy silver and gold bullion from online dealers the pricing displayed on their websites can be confusing. It can sometimes be hard to tell if you’re getting a good deal or not. All bullion dealers, whether online or a local coins shop, price their bullion relative to the spot price of the precious metals. The price the dealer charges over spot price is called the dealer premium. The only way to know whether or not you’re getting the best price when you buy precious metals online is to compare the dealer premiums over spot price. Comparing dealer premiums for a particular item, whether it’s the latest American Silver Eagle coins, 10 oz silver bars, or Pre-1933 gold coins, can be a tedious and time consuming job. Looking for the same item across multiple dealer websites takes time. FindBullionPrices.com provides tools to help simplify the process for buying silver and gold bullion from online dealers. 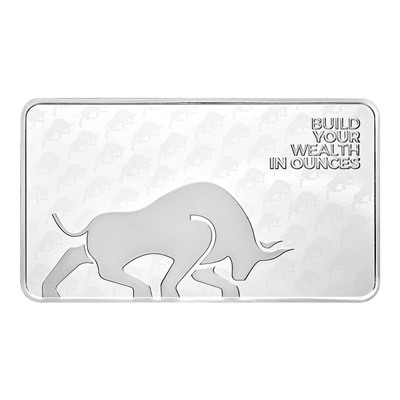 We pull the latest prices from many trusted and reputable bullion dealer websites for over 300 unique products. Each product listing is designed to make it easier to decide which dealer has the best deal when you buy bullion online. The product listings display the current spot price, including the melt value for each item. The current price the dealer is selling an item for is displayed, along with the calculated dealer premium over the melt value. 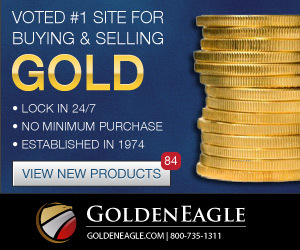 For each product we try to show as many dealers as possible that are selling a particular gold or silver coin. Dealer inventories can change quickly so we may not always show every dealer that is selling a particular item, though we try to do the best we can. Many online bullion dealers offer free shipping when you place an order over a certain dollar amount. 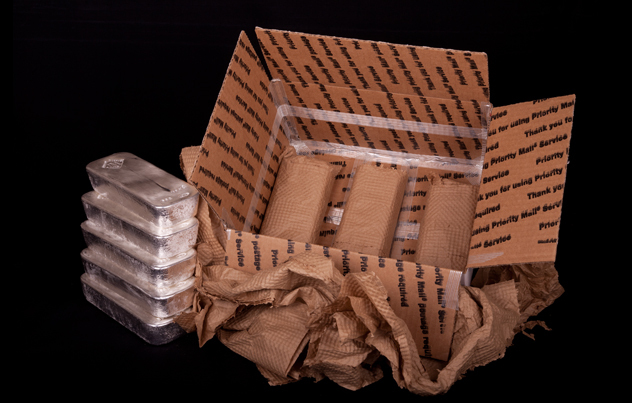 For a lot of bullion dealers, the free shipping threshold is that orders over $99 ship for free. The cost of the shipping is generally included in the dealer premiums. 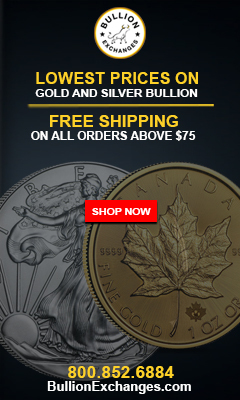 Several online bullion dealers offer free shipping for all orders regardless of the dollar value of the order. These dealers typically have much higher premiums per item to cover the shipping costs. Still, there are other dealers that are more transparent in their pricing and cost structure. They may not offer free shipping at all, or have a higher minimum order dollar value threshold for offer free shipping. As silver and gold bullion are commodities, market conditions dictate the price trend which affects the price you pay. As with any business, each dealer has different levels of overhead, operating costs and desired profit margins. Some online bullion dealers prefer high volume with lower margins while others may charge a heavy premium, especially when purchasing lower quantities or lower order values. The top trusted and reputable online bullion dealers willing to compete on both service and price, who are interested in establishing long-term stacker customers that will continue to buy from them on an ongoing basis, are the dealers will to compete on price and provide the best customer service. Our dealer listings section has a page that shows the payment methods accepted by dealer accepts and displays information regarding the shipping policies, minimum order value thresholds for free shipping and more. Virtually all online bullion dealers accept credit cards, checks and wire transfers for payment. Dealers that accept credit cards and PayPal as payment methods typically incur a fee for each transaction. The fee that credit card companies and PayPal charges the dealer are typically 3% to 4% of the dollar value of the order. These fees are included in the cost. Online bullion dealers often display on their product pages two or three different prices. Dealers will usually display the Cash Price and the Credit Card/PayPal price, and some dealers may display a third category that have begun accepting BitCoin and other cryptocurrencies for payment. The lowest price is the Cash Price. The Cash Price when you buy gold or silver from an online dealer represents the equivalent to walking into the store and paying cash. This is obviously not possible when making an online transaction, so this price also often represents the price if you were to mail a check to the dealer, use an e-check option or perform a wire transfer. Some credit card companies and payment processors have requirements that forbid merchants from charging a fee for accepting credit cards as a payment method. Online bullion dealers get around this by offering the items for sale at a Credit Card/PayPal price that is typically 3% to 4% higher than the Cash Price. While the Cash Price is often referred to as a discounted price for using Cash, Check, e-Check or wire transfer as a payment method. In celebration of the US Mint releasing the 2019-W Quarters into the wild, the coin grading company PCGS, has announced a number of rewards and bounty programs to those who submit some of the first coins for grading. The reward of $5,000 for first qualifying 2019-W Lowell quarter submitted and certified to PCGS has been confirmed, and we are now proud to announce a $2,000 reward to the first person to submit a 2019-W American Memorial Park quarter to PCGS for grading and encapsulation. 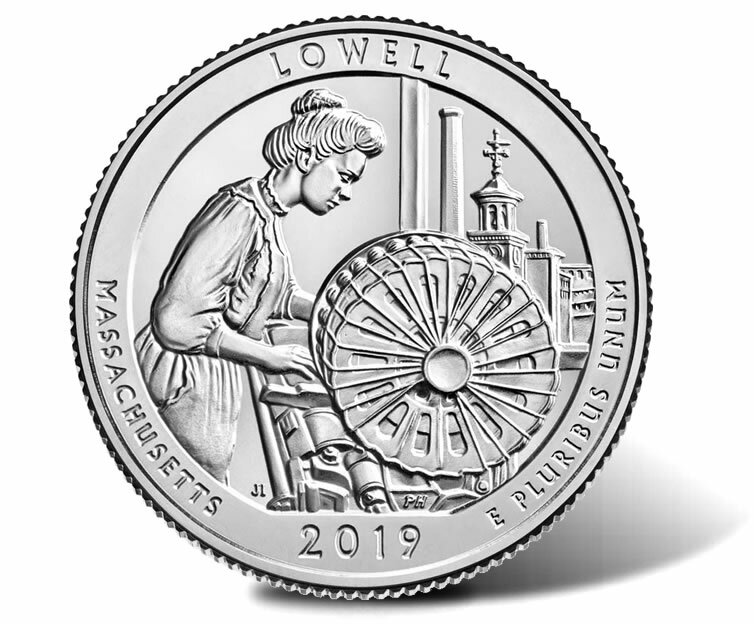 The reward for the first qualifying 2019-W Lowell quarter was split between two nearly simultaneous submissions. Additional rewards of up to $2,000 are being offered for additional W mint mark quarters that are scheduled to be released this year by the US Mint. Any quarters submitted for grading with PCGS during the early release period will receive special designations noted on the coin holder labels for those discovered and submitted during the first week of release, noted as “First Week of Discovery”. Those submitted during the first 45 days following the release will receive a designation as “Early Find”. More information about the rewards bounties and special designations celebrating the 2019-W West Point minted quarters can be found on the PCGS 2019-W Quarter Quest Website. The “Trap Coin”, designed and sculpted by Roman Booteen is a uniquely designed and carefully crafted “Hobo Nickel” in 2017. The coin’s unique spring loaded finger trap contraption has caught the attention of coin collectors and art collectors and many more. The coin sold at auction for over $10,000 and The Heads or Tails Coin Company purchased the rights to reproduce the design, complete with the fully functional trap mechanism. The reproduction trap coin is now available for purchase. The reproduction is limited to only 999 replica coins. 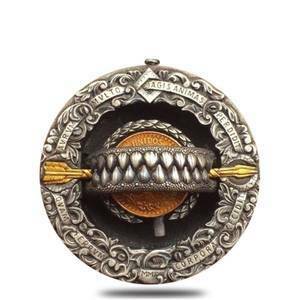 The coin’s bezel, jaws and trap are cast from .925 Sterling Silver. The obverse of the coin features a Morgan Dollar that has been domed to hide the mechanism of the trap. 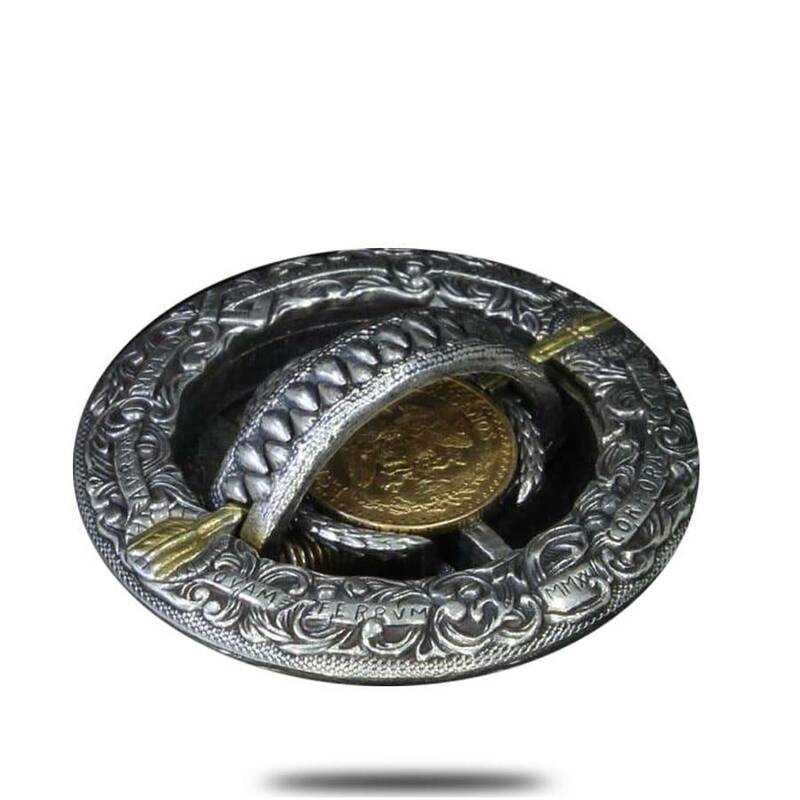 The reverse features a Mexican Dos Peso Gold Coin and the spring-loaded trap. The “Trap coin” makes an excellent gift for any coin or precious metals enthusiast, investor or collector. Buy the Trap Coin for the best price from a trusted and reputable bullion dealer. The Perth Mint of Australia, renowned for producing some of the highest quality gold and silver bullion coins, has released their official mintage numbers for 2018 bullion and numismatic coins. The Australian Red Kangaroo Silver Bullion Coin Series, which made it’s debut in 2015, has seen it’s popularity decrease since it’s peak in popularity in 2016. More information regarding official mintage totals for bullion coin produced by The Perth Mint for their can be found on The Perth Mint website. What determines Silver Eagle prices? Silver eagle prices are consistently higher per ounce than generic rounds. Investors that are new to buying silver and other precious metals are often confused by the prices of what seem to be the same or similar items. At the end of the day both are still 1 troy ounce of silver. Some of this confusion is due to the lack of transparency from dealers who rely on customers paying high premiums over spot price to pad their profit margins. After all, isn’t 1 troy ounce of silver bullion the same no matter who makes it? Whether it is a generic bullion round from a private mint like the Sunshine Mint, or a 1 oz American Silver Eagle coin. So why are silver eagle prices higher? The US Mint is responsible for the minting and manufacturing of American Silver Eagle coins. 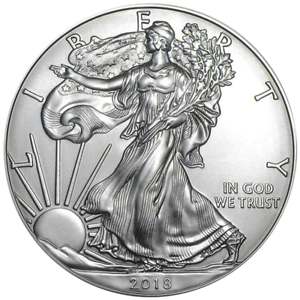 There is a cost to to manufacture and distribute Silver Eagles. To recover the manufacturing and distribution costs the US Mint charges wholesale distributors, referred to as “Authorized Purchasers”, a $2.00 premium on every newly minted Silver Eagle. The added premium by the Mint is passed along by the dealers to the end buyer or investor as part of the cost. Online bullion dealer prices for current year Silver Eagle coins are most often priced relative to the “Ask” spot price, plus the premium cost that the dealer has incurred from the wholesaler and the US Mint. The price per American Silver Eagle coin will typically range from $2.50 to $3.50 over spot price per one ounce coin. With current spot price floating around $15.40 per troy ounce, this premium range is 16%-22% over spot per ounce. You can save money on dealer premiums if you buy Random Year American Silver Eagle coins. Random Year Silver Eagles are often secondary market coins that dealers have bought back in tubes from investors in BU condition. Since dealers will buy back Silver Eagles at a lower premium than is charged by the US Mint, the lower premium is passed along to investors. How Much is a Peace Silver Dollar (1921-1935) Worth? The US Congress passed The Pittman Act after the end of the first World War which authorized reestablishing a one dollar coin. Initially, the US Mint began minting the Morgan Dollar in 1921 which had not been minted since 1904. During this time many in Congress and the Treasury were interested in replacing the design of the Morgan Dollar with one that was more symbolic of the peace reached at the end of World War I. In 1921, then Treasury Secretary Andrew Mellon, approved the design of the Peace Dollar. 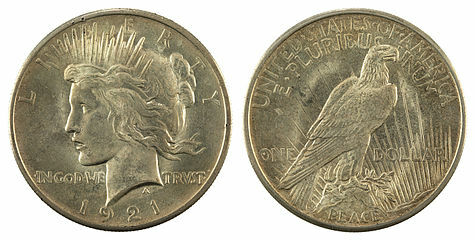 The Peace Dollar was minted from 1921 until 1935. Throughout the years that the Peace Dollar issued, various mintage amounts from the major US minting facilities in Philadelphia, Denver and San Francisco struck coins. The Peace Dollar was designed by Italian-American sculpture Anthony (Antonio) de Francisci. At only 34 years old at the time of the design competition, de Francisci was the youngest of all of the sculptures competing. The obverse of the Peace Dollar features the head and neck of the Goddess Liberty. Her profile depicts flowing hair with a radiant crown on her head. The coin’s obverse also features the phrase “In God We Trust” and the word “LIBERTY” across the top edge with the year of minting being inscribed below. The reverse of the Peace Dollar features a sitting eagle at rest, symbolic of the strength and influence of the United States throughout the world, clutching an olive branch, a recognized symbol of peace. The bald eagle is high atop a perch with rays of sunlight radiating in the background. The word “Peace” is inscribed on the lower edge of the reverse, with the inscription “UNITED STATES OF AMERICA,” “E. PLURIBUS UNUM” along the top edge, and the phrase “ONE DOLLAR” stretching on either side of the center of the coin. The mint mark on the Peace Dollar is on the coin’s reverse located above tip of eagle’s wings. Coins which were produced by the Philadelphia Mint lack an identifiable mint mark. Coins produced at the Denver Mint will show a “D”. While Peace Dollars minted at the San Francisco Mint will show an “S” mint mark. The Peace Dollar is popular with both collectors and investors for a variety of reasons. Collectors see the coin with historical significance given when it was released and the reasons and symbolism inherent with it’s design. The earliest versions of the Peace Dollar are nearly 100 years old. Investors see both the intrinsic value of the composition of the Peace Dollar, which is compromised of 90% Silver. Investors also see the historical significance to the collectors which helps to keep the secondary market premiums for Peace Dollars higher than just their melt value. It’s common to buy circulated silver coins that were minted prior to 1965 for a small premium over their melt value. However, Peace Dollars and other 90% silver dollar coins are often sold at a higher premium, even for coins that are in cull condition. The highly anticipated commemorative release of The Simpsons Donut 1 oz Silver Coin from The Perth Mint has finally arrived. The coin, which is legal tender in Tuvalu, has a limited mintage of only 3,000 coins worldwide. The Silver 1 oz Proof Coin is a special release commemorative coin to celebrate the most popular animated television series in history. 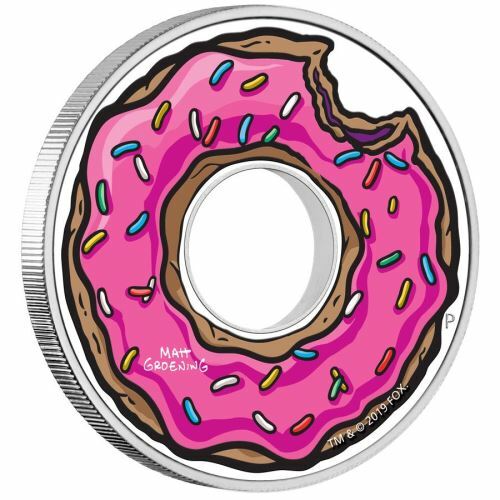 The obverse of the coin features a unique donut design that has been colorized and stylized like the TV show. The coin has a hole punched in the center to give it an authentic donut look. The reverse of the coin features a bust portrait of Her Majesty, Queen Elizabeth, along with the weight, purity and face value details around the rim of the coin. Many retailers are sold out. The Perth Mint has sold out of the limited mintage. There are some coins being sold on eBay for a reasonable premium given the limited mintage. Which dealers are charging sales tax on bullion? As a result of the Supreme Court ruling last year in South Dakota v. Wayfair Inc some online bullion dealers have begun charging sales tax on purchases. Many buyers had previously switched to buying bullion online in states that charge sales tax in order to keep the cost of investing in silver and gold bullion down. Over the past few months several major dealers revamped the checkout process on their website’s to include sales tax for states that require it. 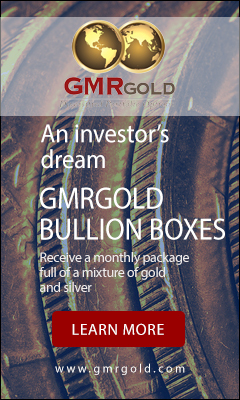 Among those dealers has been two of the largest, APMEX and JM Bullion. Both dealers have published pages on their respective website’s related to sales tax and which states they are required to collect sales tax for on bullion purchases. Even with these guides there is still a lot of confusion about sales tax with regard to gold and silver bullion, gold and silver coins, and other numismatic and bullion related items. Each state has it’s own unique definitions of how each are categorized and how they determine if sales tax should be charged on purchases. Some dealers have also begun charging sales tax on bullion related items purchased through their eBay Stores. This has been leading many buyers to alternative dealers that have not begun charging sales tax, as well as seeking out alternate online platforms and communities for trading precious metals and other local sources. Which dealers sell silver at spot price deals? The best deals on silver is when you’re able to buy silver at spot price. There are several dealers that sell silver at spot price deals, primarily as a means of attracting new customers. Silver spot price deals are an incentive for new customers to buy silver from a dealer that they may not have bought from before. The silver at spot price deals are special offers targeted at attracting new customers. Acquiring a new customer by offering a spot price deal allows a dealer to show new customers that they provide better service and at a better price than their competition. For people that buy silver, the silver at spot price deals allow them to buy from a new dealer without the risk of high premiums. Silver buyers and investors are always looking for the best deal, especially as dealer premiums from the largest dealers continue to rise. Smaller dealers that offer a silver at spot price deals use it as a way to earn a new customer. Showing a new customer the quality of their customer service, allows the dealer the opportunity to contact that customer after the first transaction to show the customer that they offer better pricing than the big guys. A comprehensive list of Silver Spot Price Deals is available on our website. BGASC – 5 oz Silver Bar at Spot Price – One bar at spot price can be added on to each order. This offer is not limited to one per household. BOLD Precious Metals – Offers two different spot price deals for new customers. Only one offer can be redeemed at spot price. Several times per year other dealers will offer flash sales of silver at spot price as a way to move excess inventory. FindBullionPrices.com keeps track of when the dealers offer silver spot price deals.